Who really thought all the drama associated with national signing day would actually stop on February 6th? Ole Miss went on to sign the best class in school history and also the best class in history by a “non-traditional power”. The spoil of victory also brings in the shadow of doubt and the accusations of naysayers. 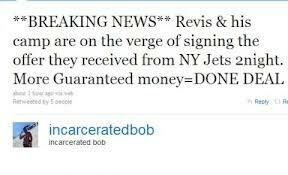 One name that has had twitter, message boards, and Facebook in an uproar is Incarcerated Bob. He has been mercilessly antagonizing Coach Hugh Freeze and all of rebel nation via twitter. Before we go any further, who in the world is Incarcerated Bob? After taking some time and scouring the net, the best information I could find on Bob was a piece written by Robert Silverman who is a big time blogger who has also done work with ESPN. He got his name and his first bit of fame as a regular caller on the Boomer and Carton radio show, on WFAN 660 in New York. He received his nickname by the show’s host due to a prison stint he earned by getting into an altercation with a Patriots fan during the 2008 Super Bowl. Since his return and higher profile, Incarcerated Bob has made his name and living doing 2 things: picking winners and breaking stories. I could go on because Bob has been on quite the tear of late but I won’t. He claims to have paperwork of a vehicle for Nkemdiche that was paid for by an Ole Miss booster and has signatures of booth the relative and the booster. He also claims that he has been threatened to be sued by someone associated with Ole Miss I presume. For reference, he was threatened a lawsuit by the NBA and that didn’t stop so I don’t think he will back down now. It will be interesting to see if this guy does in fact have anything and is not another Danny Sheridan “bagman in 2 weeks” scam. My personal opinion is that I don’t believe he has a smoking gun. The only thing that even makes me question myself is his motive. What is it? I cannot figure out what interest a handicapper in New York has in an Atlanta prospect who signed with Ole Miss. It’s a very curios situation. Sheridan’s motives were transparent. A hatred for his school’s rival led to a smear campaign against them. There are a million alleged scandals, true or not, Incarcerated Bob could have chosen to promote himself. The question myself and many Mississippians wonder is why did he chose this one?